You know that moment of ecstasy that is experienced on the first bite or sip of something truly delicious? Your eyes forcibly close as an expression of delight spreads across your face. You pause and then you go back for more. The term was coined a few years back after my first visit to San Joses’s unbeatable Psycho Donuts. They specialize in doing crazy and creative doughnuts. Crazy certainly is the theme they go for with both of their locations decked out as if they were inspired by the set of One Flew Over the Cuckoo Nest. Complete with the counter staff being dressed as ward nurses. Oh and whilst you are deciding which flavor doughnut that you want to try first, they give you bubble wrap to help manage the stress of the decision. 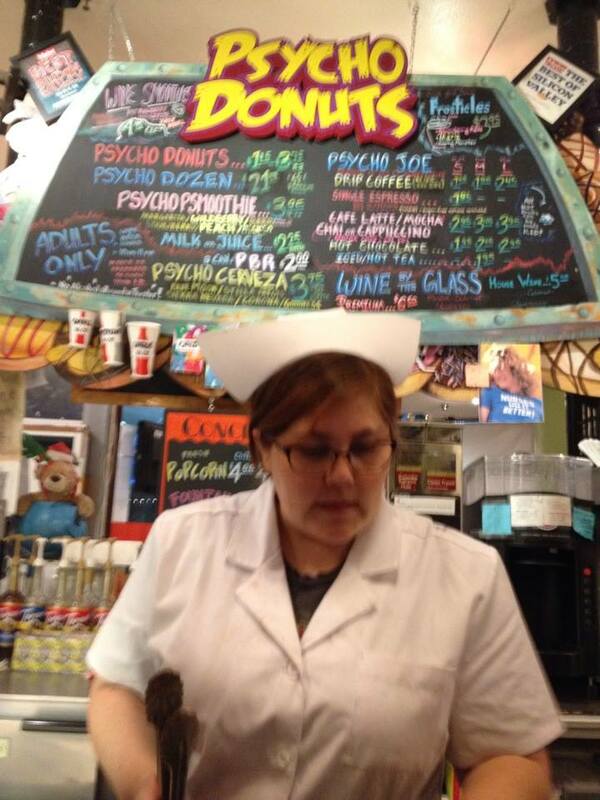 My first doughgasm came with the help of Psycho Donuts’s Marla doughnut. It is a maple doughnut that is topped with peanut butter and crushed up Butterfinger candies. It took me some time to get the name…Marla Maples…get it? lol. One bite of that beauty and it became the doughnut by which all further doughnuts have been judged. Since then, I have been doing back whenever I get the chance. Which isn’t as much as I like now that I am living down in Los Angeles. That is likely a good thing for my waist line. 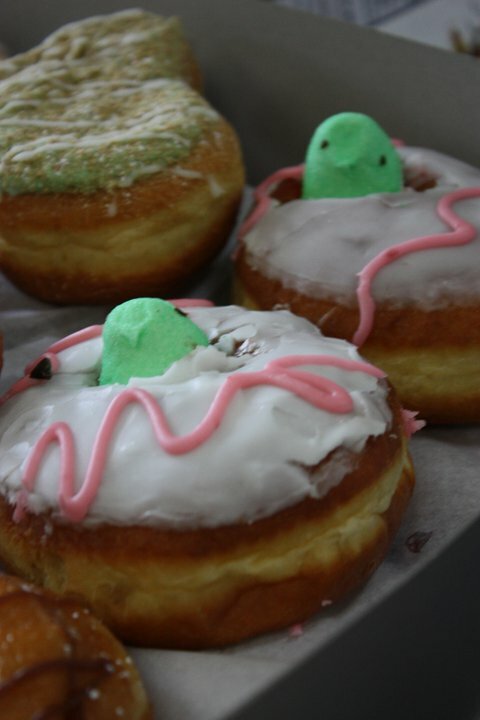 Not only has each doughnut I have tried been delicious but I love their sense of whimsy. These are some photos from a visit I made on Easter a couple years back. 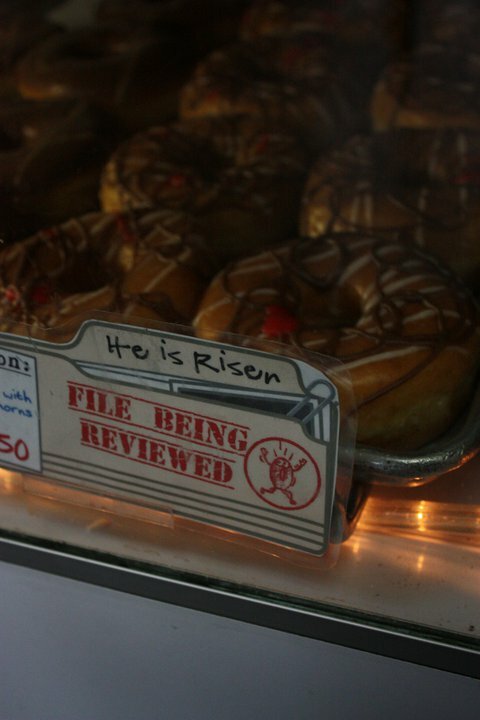 The ‘He is Risen’ doughnut name made be chuckle out loud even before I noticed that it was decorated like a crown of thrones complete with drops of blood. My mind went right to Homer’s ‘mmm Sacrilicious’ moment on the Simpsons. May every first bite in your life induce a doughgasm greater than the one before. 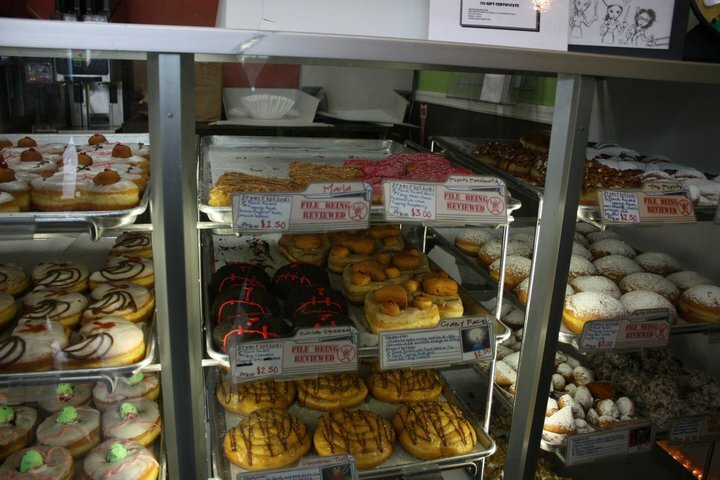 This entry was posted in Foodie and tagged Doughnuts, San Jose. Bookmark the permalink.